RCMP and firefighters descended on Anita Place early Saturday afternoon and residents are expecting the order will be enforced. "This is the biggest atrocity that I've ever seen. I can't believe they're doing this to us," said camp resident Peter Goodrow. Advocates of the camp residents said people have not been told when or if they'll be able to return and what they should do in the interim. "There's an uncertainty that looms over the camp and a feeling that this is actually a means of taking down structures and other things that are considered a fire hazard," said Dave Diewert, a member of Alliance Against Displacement. On Friday, an evacuation order was issued in response to three "significant" fires at Anita Place over the last 48 hours, destroying several tents and structures, according to the City of Maple Ridge. In a press release, the city said the order describes how there is an "existence of fire hazards and risk of explosion," adding "there is imminent and serious danger" to people and property if residents continue to live at the tent city. Homeless advocates are suspicious of the fires and believe they were deliberately set by people who are against the tent city. "We don’t know the cause of the fires. But what we do know is that since the court order was issued, there has been an escalation of, what I would say, hatred in the outside community towards the people who live here and the camp in general," said Caitlin Shane, a lawyer with Pivot Legal Society. Goodrow was at the camp when two of those fires broke out. He said he is angry by what he believes was a delayed response from firefighters. "They told us they were expecting fires, that's what we were at risk of, how come it took them 15 to 20 minutes to help us? I was absolutely furious," he said. Officials said multiple propane cylinders have been found in the charred remains of the burned structures. The city coordinated an evacuation plan with the assistance of the fire department and RCMP detachment. 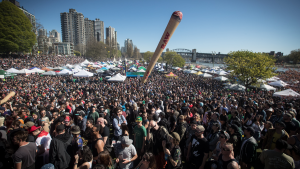 Last week, RCMP began enforcing a court order that allows the city to address fire safety concerns and confiscate items, such as propane tanks, gas cans, generators and portable barbecues. Diewart described the events of last weekend "an assault on the camp." "Rather than provide acceptable sources of heat, rather than provide electricity to the camp, rather than provide actual housing, it's just been an ongoing process of criminalization and so-called vigilante justice," he said. Mounties arrested six people associated with Anita Place during the fire safety enforcement last Sunday. 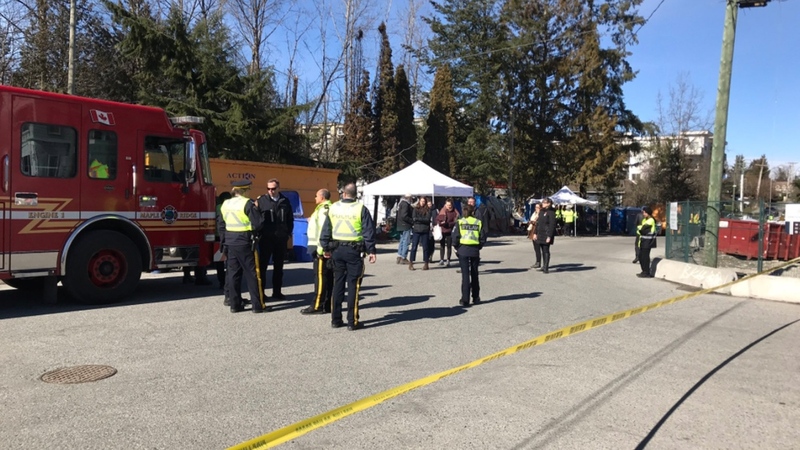 The city said it is working with BC Housing to ensure the homeless camp residents have shelter during the evacuation period. The Minister of Housing said the province is offering significant support and has activated emergency social services to ensure the evacuees have access to shelter, food, and health and social services. "The safety of the community, and the residents being evacuated, is our immediate focus," said Minister Selina Robinson. "We must move quickly and work together to get more people into the safe and supportive homes they urgently need." Some residents of the homeless camp moved into a new housing complex last fall. The modular building has 53 self-contained units and offers support services for residents. Mounties and firefighters arrived at Anita Place homeless camp.